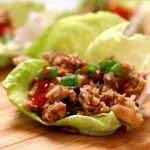 Slow Cooker Chicken Lettuce Wraps–an incredibly easy and delicious recipe for lettuce wraps. Hoisin sauce gives these ground chicken lettuce wraps lots of flavor and the rice and water chestnuts add texture. Get a whole head of lettuce ready because you’re not going to want to stop eating these chicken lettuce wraps! Ground chicken: I had a little bit of trouble finding ground chicken but I did end up finding it. I asked the butcher and he pointed it out. It’s a little more expensive than ground turkey or regular chicken breasts but it is so worth it. Butter Lettuce: You can buy regular iceberg lettuce or romaine lettuce but I opted for the fancy butter lettuce. Butterhead lettuces are tender, with loosely-coiled leaves. The leaves are almost never limp or weak. They have a bit of crunch. You can find butter lettuce in a plastic clamshell case with a root still attached. Hoisin Sauce: Hoisin sauce is a fragrant, pungent sauce used frequently in Asian marinades and dishes. It is sometimes called Chinese barbecue sauce. I find it in the Asian section of my grocery store. You can pick up your water chestnuts in the same section. Low Sodium Soy Sauce: If possible, buy a low sodium soy sauce or else your lettuce wraps will be overpowered by saltiness. Rice: I used a long grain white rice but you could also use jasmine rice for this. I wouldn’t use brown rice for this recipe because it won’t cook as quick as the chicken. You could probably use an instant brown rice though. I also thought that quinoa would work but I haven’t tried it yet so I can’t say for sure. To make Slow Cooker Chicken Lettuce Wraps I used my 6 quart oval Kitchenaid slow cooker. * I love this slow cooker. It cooks low and evenly. I love the medium heat choice because most slow cookers that I’ve seen only have the option of cooking on low or high. If you’re going to buy just one slow cooker, this is the one that I recommend. 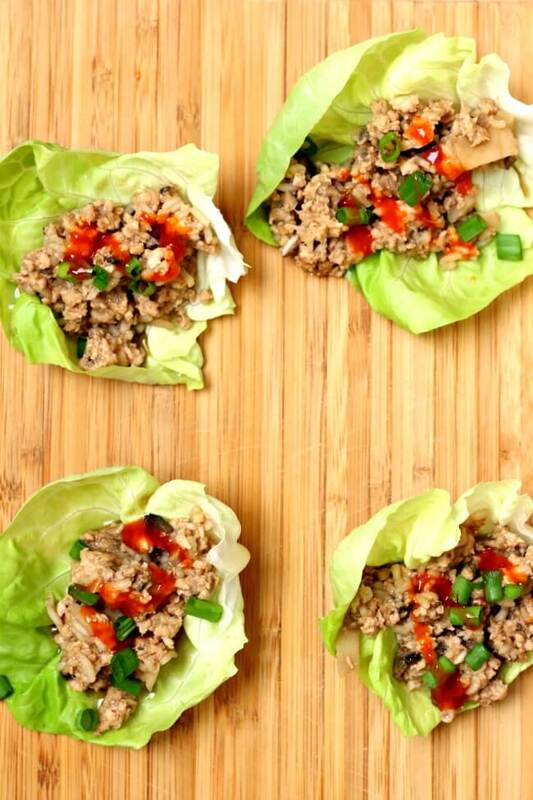 An incredibly easy and delicious recipe for lettuce wraps. Hoisin sauce gives these ground chicken lettuce wraps lots of flavor and the rice and water chestnuts add texture. Get a whole head of lettuce ready because you’re not going to want to stop eating these chicken lettuce wraps! Add the chicken, mushrooms, garlic powder, chicken broth, hoisin, soy sauce, rice and water chestnuts. Stir to break up the chicken. Cover and cook on low for 4-6 hours, or until chicken and rice are cooked through. Remove the lid. Stir a bit. Prepare the lettuce leaves and green onions. Scoop a bit of the chicken mixture down the middle of a lettuce leaf. 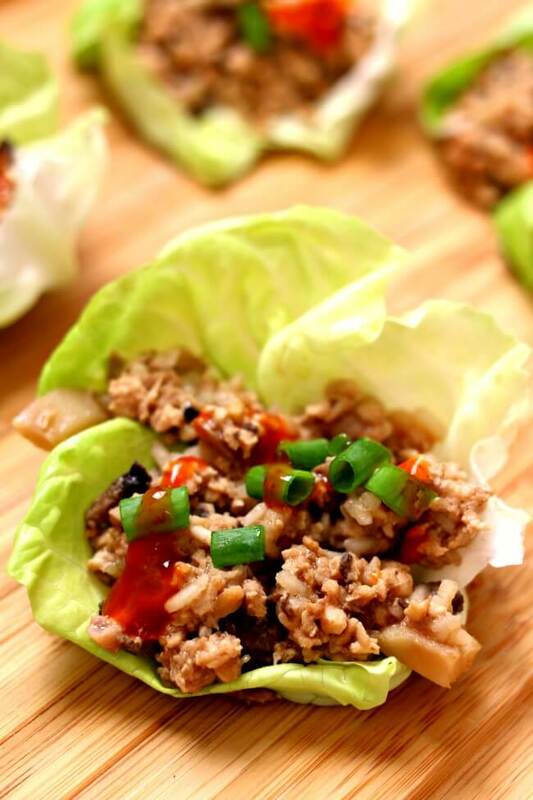 Sprinkle with green onion and, if you like a little kick, drizzle a tiny bit of sriracha on top of each lettuce wrap. 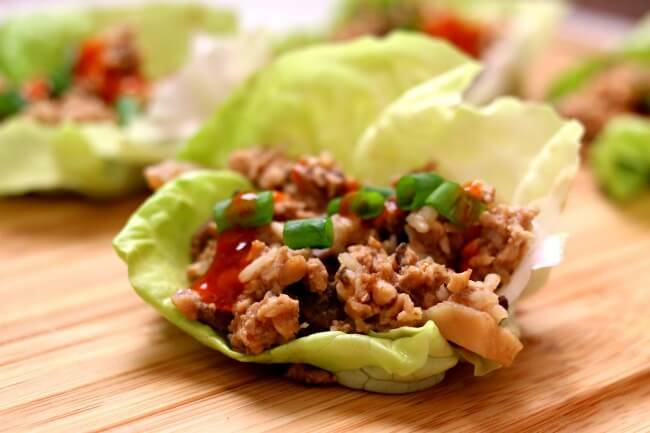 Like this recipe for Slow Cooker Chicken Lettuce Wraps? Get all my new recipes delivered to your email inbox by signing up below. What is the substitution for quinoa instead of rice? I haven’t tried that but I would rinse the quinoa and keep the amounts the same as the rice. Do you cook the ground chicken first? I like my lettuce wraps with peanut sauce dip.